Above are my tasting notes for the Fall Wine Preview my friend Josh hosted last week at Spring Boutique, the retail wing of Daniel Rose's mini-empire in Paris 1èr. 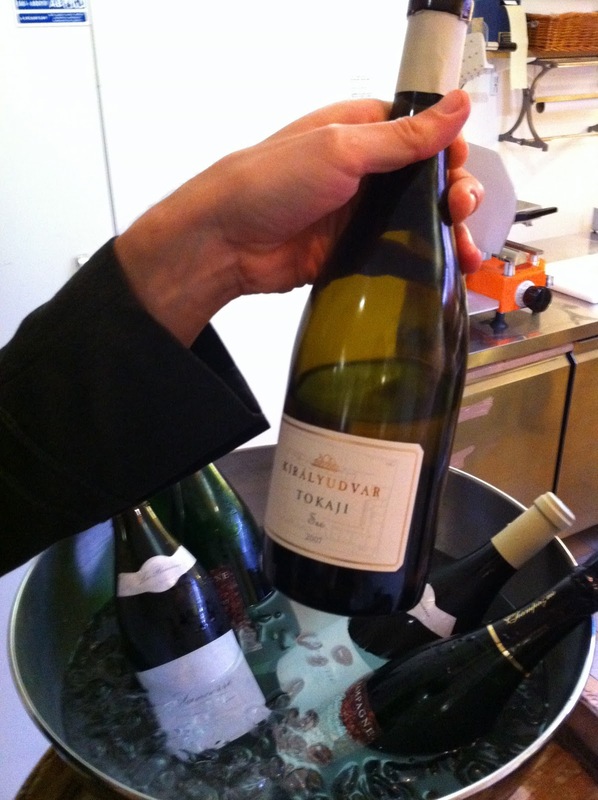 Public retail tastings are ordinarily kind of boring. I don't always take notes. Unless a particularly great vigneron is involved*, you often get just a thin crowd of goggle-eyed wine neophytes eagerly swirling and sniffing a range of easy-sell barbecue wines - whatever the distribution rep needed to unload on the retailer. Spring Boutique isn't really on the same planet as that kind of wine shop. What's available here is continually rotated through the stunning wine lists at the nearby Spring restaurant and wine bar. In a previous post about the wine bar I mentioned how the glass pours there all seem chosen particularly for dramatic effect; how all of them are eminently memorable examples of their types. Same goes for the selections here. Josh and co. deserve further credit for actively seeking out interesting wines by producers that are not French - Les Crêtes, from Italy's Valle d'Aosta, and R. Lopez de Heredia from Spain, to name just two. In total there were three open that night, all of them fairly striking. But of particular interest to everyone was the 2006 Alsace Grand Cru "Mambourg," which was one of the strangest wines I've had in a long time. 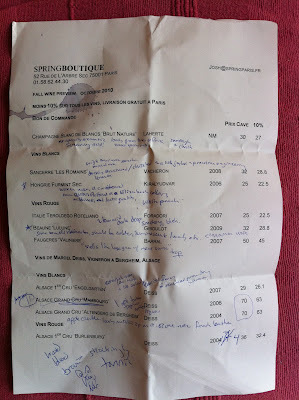 With biodynamic Alsatian field blends I usually expect medium-to-heavy sweetness, but apparently the "Mambourg" is famous for being consistently dry. Deiss' Grand Crus are not varietally labeled but I'm told this one is blend of all the Pinots. A tremendous mineral-savory nose made me think of twine and rope, for some reason. The palate was a churning eddy of lychee and oyster liquor, among other things. The absolute greatest wines are, somewhat perversely, always awkward social occasions, since they stop conversation and force everyone to search for descriptors of the indescribable. This was one of those. *Something that understandably occurs rather more often here in France. Désolée, USA.